Iransaga - Persian Art, The Mongols ; Ilkhans Contd. Persian miniature painting began in the Mongol period at the beginning of the 13th century, when Persian painters were exposed to Chinese art, and Chinese painters worked at the Ilkhan courts in Iran. It is not known whether Persian artists went to China before the 15th century; but it is certain that Chinese artists, imported by the Mongol rulers, went to Iran, like those whom Arghun used to paint the walls of Buddhist temples. Unfortunately, the works of these artists as well as the whole collection of secular mural paintings are lost. Miniature painting, of a high artistic level, was the only form of painting to survive from this period. In Ilkhanid miniatures, the human figure, which had previously been depicted in stocky and stereotyped fashion, was now shown more gracefully with truer proportions; drapery folds gave the impression of depth. Animals were observed more carefully than before and lost their decorative rigidity, mountains lost their smooth appearance and skies were enlivened by typically curly white clouds with twisted garland shapes. These influences progressively fused with Iranian paintings and were finally assimilated into new forms. The major centre of Ilkhan painting was Tabriz. 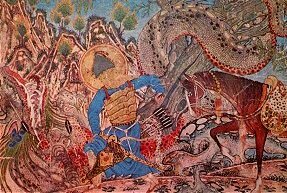 Some of the effects of Chinese influence can be seen in the painting of Bahram Gur's Battle with the Dragon from the famous Demotte "Shah-namah" (The Book of Kings), illustrated in Tabriz in the second quarter of the 14th century. The mountains and landscape details are of Far Eastern origin as of course is the dragon with which the hero is locked in combat. By using the frame as a window and placing the hero with his back to the reader, the artist creates the impression that the event is actually taking place before our eyes. Bahram Gur's Battle with the Dragon. From the Shah-nama Ferdowsi, Tabriz. Second quarter of the 14th century. Less obvious, but more important, is the vague undefined relationship of immediate foreground to distant background, and the abrupt cutting off of the composition on all sides. Most of the miniatures of the Demotte Shah-namah are to be considered among the masterpieces of all times, and this manuscript is one of the oldest copies of Ferdowsi's immortal epic poem. The Shah-namah was frequently illustrated in the Ilkhanid period, probably because the Mongols developed a pronounced taste for the epic during the 13th and 14th centuries. Ilkhanid scribes and illuminators brought the art of the book to the foreground. The schools of Mosul and Baghdad rivalled the best Mamluke1 work and may indeed have laid the foundations for it. Characteristic of this school is the use of very large sheets (up to 75 x 50cm, 28" x 20") of Baghdad paper and correspondingly large-scale script, especially muhaqqaq2. Page from a Koran in muhaqqaq with Persian interlinear translation and prophetic traditions in Kufic characters around the pages. Late 13th to early 14th century. Metalworking, which had flourished in north-east Persia, Khurassan, and Transoxiana, also suffered terribly from the Mongol invasion; however, it did not die out completely. After a gap in production of almost a century, which can be paralleled closely in architecture and painting, the industry revived. The key centres were in Central Asia, Azerbaijan (the principle centre of Mongol culture) and Southern Iran. The combination of Persian style with Mesopotamian and Mamluke is characteristic of all the Ilkhanid metalwork. Mesopotamian metal inlay seems to have been inspired by Persian techniques, which it developed and perfected. Brass was substituted more and more for bronze, and gold inlay replaced red copper. There was also a tendency in Mesopotamian work to cover the complete surface by minute ornamental patterning and human and animal figures were always well defined. However, Persian works showed a preference for a technique of inlay and engraving which avoided rigid and precise contours. There was also a reluctance to cover the whole surface with ornaments. Pen box - brass inlaid with silver and gold, signed by Mahmud ibn Sunqur, dated 1281. Towards the end of the 13th century, the Far Eastern influence is evident in both the Persian and Mesopotamian styles in the more naturalistic treatment of the plant ornaments (among which appear the lotus flower...) and the typically elongated human form. 1. Mamluke - The Mamlukes were originally Turkish and Circassian slaves who served in the Ayyubid army and later seized power for themselves. The greatest achievements of the Mamlukes were the final extinction of the Crusader states in 1291, and the stemming of the Mongol advance at the Battle of Ayn Jalut in Palestine in 1260. The Mamlukes owed allegiance to the Abbassid Caliph, and after the sack of Baghdad in 1258 they re-instated a relative of the last Caliph in Cairo. 2. Muhaqqaq - a majestic Koranic cursive script.